The trip has finished and a lot of you have questions on how I did it, how can you do something like this and what’s the story behind sanDRina’s name? Join me for a post-trip Live Chat on Yahoo! India this Monday at 2:30 pm IST (9:00 am GMT) and ask away 🙂 tweet your queries with the #JamminIndia hashtag. Got questions on traveling, motorcycling, photography, being a digital nomad, what it takes to get up and leave, how to sustain a long duration journey and more? Then join me for a Live Chat on Yahoo! 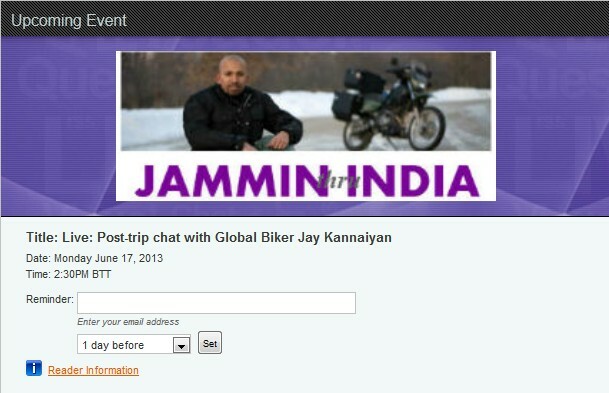 India Travel on Monday, May 13th at 2:30 pm IST (9:00 am GMT). Ask or tweet your queries using the #JamminIndia hashtag.